Too enthusiastic? published on March 6, 2017 Rachel10 Comments on Too enthusiastic? This is quite a recurring problem for me. I try to prevent working on comics in the weekends (or limit it to one day instead of the entire weekend), but when I’m swamped with work during the week… it just happens. Especially around a deadline for a project I’m not really available for playing board games. 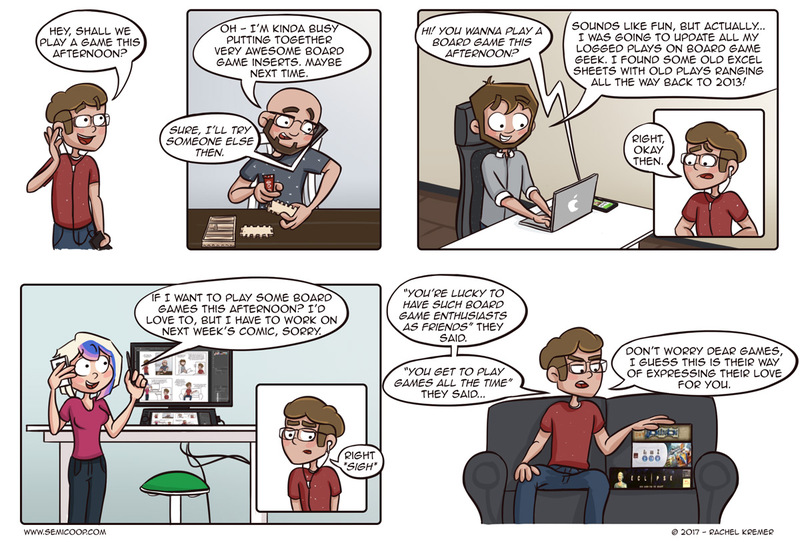 It’s a silly thing when you’re making a comic about board games, but don’t actually have time to play board games thanks to the comic. Don’t worry, I/we still play enough games to get ideas and inspiration for more comics. 😉 Today’s comic is number 102 by the way – we passed 100 strips! Hurray! What we did play again last week was Steampunk Rally and that game is quickly becoming a favorite of ours. It’s fun, quick and has that same ‘relaxed’ vibe as Roll for the Galaxy. It’s competitive, but players get to do their own thing without feeling a ton of pressure from the other players. And every time it’s unclear who’s actually going to win the game right up to the last turn. Really a game we would recommend checking out if you’re looking for a shorter, lighter game with a cool theme that scales up nicely to eight players. Do you have any creative/fun/interesting plans for a board game related project you’re working on right now? ahh, inserts, gamedays and other stuf. you want to game, but life happens. congrats on the 100TH commic page!!! Would your improvements make it shorter? I’ve been looking at the game because it seems like a cool way to learn more about Dutch history, but that is one long game! I don’t think it will make it shorter. Maybe quicker to learn? There is just a lot of bookkeeping in the game. The decisions are few but tough, and the consequences take some time to resolve. Last time we played 2 (of 5) rounds in 4 hours. With 5 players, 3 of which were playing for the first time. Usually one to be that guy seeking out others with whom to play, I have found it funny that I’m suddenly totally off guard when others tell me to bring some board games when I come over for a visit! So, my project has been to create a spreadsheet of my collection. It started with columns for minimum number of players, maximum number of players, time to play, age, and BGG weight. That way I could sort and quickly browse through all my two-player games, for instance. -I’ve even started to take all the Mechanics listed on BGG and make a column for each and if a title includes that mechanic, I’ll put an X in its row. That way, I can sort by a certain mechanic’s column and find all my Action/Dexterity games like Flick ‘Em Up or Ice Cool, for example, or all my games that have a Modular Board. Thanks for sharing! How do you use the “time for weight” score? I see how you calculate it but now it seems that Android isn’t that different from Above and Below while those games a worlds apart in when I would suggest them. But you’re right, the numeric interpretation gets a little skewed in the middle: a heavy, long game (like Android) and a medium-weight, medium-length game (like Above & Below) can have close numbers, proportionately speaking. Like Neuroshima Hex and Android Netrunner are satisfyingly complex games for how quickly they play. While Munchkin, Dead of Winter, and Firefly aren’t all that brain-burning relative to how much table time a single game provides if you want to really cozy in for an afternoon. Me and my better half are working on categorising our collection of games as well as improvements on a few of them. One that comes to mind is Sky Traders, which is kind of nice to play but its economy system could use an overhaul, it’s too predictable because it’s based on player votes, which can be bought. Other than that, figuring out how to make nice inserts for the games we have. I don’t have access to a laser cutter anymore, so alternatives have to be thought out a bit. There is always 3D printing, but that takes a serious amount of time.